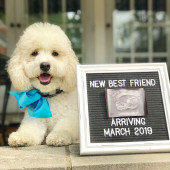 We are over the moon with excitement to welcome our baby boy in the spring! Thank you for sharing in that love! P.S. We ask that you please ship your gift to the address on file.